Black holes sparked the public imagination for almost 100 years. Their presence in the universe has been long debated; however, the detection of X-ray radiation coming from the center of the galaxies, a feature of black holes, has put an end to the discussion and undoubtedly proven their existence. The vast majority, if not all, of the known black holes were unveiled by detecting the X-ray radiation emitted by the stellar material accreting around them. 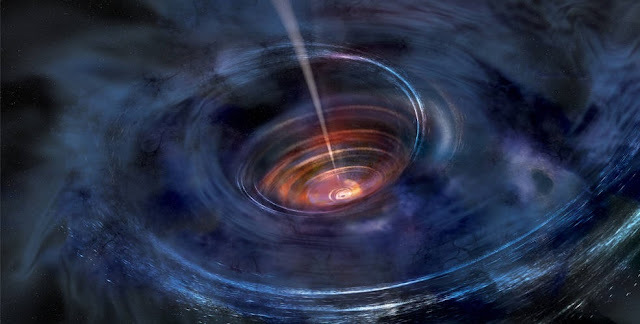 Accretion disks emit X-ray radiation, light with high energy, due to the extreme gravity in the vicinity of black holes. X-ray photons emitted near rotating black holes not only exposed the existence of these phantom-like astrophysical bodies, but also seem to carry hidden quantum messages. A recent paper, posted on the arXiv pre-print server, (Photonic Bell states creation around rotating black holes - http://arxiv.org/abs/1608.06822) argues that X-ray radiation coming from fast spinning black holes encompasses quantum information. The quantum information is encoded in the two degrees of freedom X-ray photons acquire during their journey throughout the warped and twisted space-time near the rotating black hole. The two degrees of freedom consist in polarization and orbital angular momentum of X-ray radiation and traditionally represent two qubits in quantum optics. Space-time possesses a very particular, curved and twisted, shape near spinning black holes. The curvature of the space-time rotates the polarization angle of photons emitted or passing near black hole encoding a qubit. The twist of space-time imprints orbital angular momentum to photons encoding a second qubit. These two degrees of freedom acquired by the photons encoding qubits that could process quantum information. Rotating black holes can implement quantum gates and quantum circuits, like Bell states, which are quantum counterparts of classical computer programming. Bell states measure the degree of correlation (entanglement) between the two qubits encoded by the X-ray photons and is strongly related to the spinning speed of the black holes. It is argued in the recent paper that the faster black hole spins, the stronger is the correlation between the qubits; as consequence the louder and clearer is the quantum message black hole sends to the vast Universe. Under the recent Quantum Experiments at Space Scale (QUESS) project, China launched the first quantum communication satellite, designed to connect us to a future global quantum information network. This endeavor raises hopes that the near future will connect us to the Universe’s quantum information network as spinning black holes send information about their states that we cannot “hear” yet.